The covers for Hello! Project’s first Blu-ray releases for Hello! 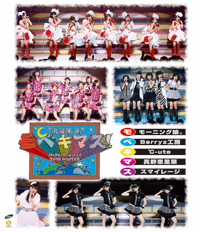 Project 2010 Winter Concert Tour ~Mobekimasu!~ & ~Shuffle Deeto!~ have been released on the official site. As you can tell they are basically just slightly more square versions of the DVD and I am not really not that surprised about it since they are re-releases of concerts that are already available, but I have to admit that I still like how the covers look even though they seem to just have been pushed together. Despite that the covers look ready for the release, and while I don’t expect to see previews from the UFA Youtube channel I do expect to see some uploads of the concert soon when it is released, so hopefully that is the case and everyone gets a chance to check it out and buy the Blu-rays to encourage UFA to release more in the future. The release date is set for 8/4. It has just been announced that Hello! 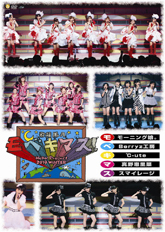 Project’s 2010 Winter Concert Tour’s ~Mobekimasu!~ and ~Shuffle Deeto!~ will be re-released on Blu-ray. This is the first Blu-ray release from H!P. I’m glad that they are finally trying out blu-ray for some releases since I have heard that the quality is a lot better than a normal DVD (I haven’t watched any blu-rays so I have no idea if that is true), although in my opinion the sales will be somewhat lower than expected for many reasons. For example, the DVD version of the concerts have already been released for quite some time now and the people that usually buy concert DVDs have already done so. Apart from that the price is roughly around 5,250 Yen for each one of the blu-ray concert DVDs, which is 1,450 Yen more than the DVD version (which means that you would have to pay about 2,900 Yen for a slight quality improvement in both releases). Despite that there will probably be many fans who will want to buy the Blu-ray because of the higher quality (higher quality is always better) so hopefully sales are high enough to convince UFA to make more H!P blu-ray releases (solo image blu-rays for example) although we will have to wait and see what happens. Two Hello! Project shuffle unit “singles” titled Compilation Single A & B (tentative titles) have been announced. The first single, Compilation Single A, will feature Tanpopo #, Pucchimoni V, and Shin Mini Moni and it will come in two versions – Regular (CD) and Limited (CD + DVD). The second single, Compilation Single B, will also come in Regular (CD) and Limited (CD + DVD) versions and it will feature High-King, ZYX-a, Aa!, and Zoku Biyuuden. Each “single” will feature new songs, instrumentals, as well as a bonus track. The new songs will be one for each group, although it isn’t clear whether the bonus track will feature only one group or all of them (most likely all of them). It’s great that we are getting more shuffle unit releases since the only release they have had was on the Pucchi Best 10 album, and even then it only featured 5 groups out of the current 7 shuffle groups (Zoku Biyuuden and ZYX-a didn’t get a release). The mention of new songs as well as bonus tracks is interesting since it might mean completely new songs and if that is the case there is the slight possibility of there being some PVs for the songs, especially with the DVD that will be included with the Limited versions, which would be great since we have only had a chance to see them perform in concerts. Even though we don’t have that much information about this new release it will be interesting to see the tracklist as well as the covers, and if we are lucky we might get a chance to see some PVs on the DVD included with the Limited versions (although there is a chance that it only has concert performances or other extras). This “single” hasn’t been officially confirmed but hopefully it is since I would really like to hear more songs from the shuffle groups, as well as a unique shuffle release. The release date is set for 6/30. A concert PB for Hello! Project’s latest concert tour titled LIVE TOUR PHOTO DOCUMENT　「Hello! 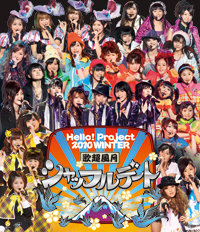 Project 2010 Winter Concert “Kachou Fuugetsu ~Mobekimasu~” & “Kachou Fuugetsu ~Shuffle Deeto~」 has been announced. According to description the PB will features interviews with Ai-chan, Shimizu Saki, Yajima Maimi, Mano Erina, and Wada Ayaka (the leaders of the groups) as well as backstage photos taken by some of the members. I’m glad to see that more and more concerts are getting PBs since it is always interesting to see photos from the concerts along with the video performances on DVD, and the added bonus of having the two concerts in the same PB is a great addition since fans will get pictures from both concert tours. Hopefully we get some previews soon since the description sounds promising. The release date is set for 5/15. The cover for Hello! Project’s Concert Tour Winter 2010 Kachou Fuugetsu ~Shuffle Deeto~ DVD has been released on the official site. I’m glad to see that they included all of the shuffle groups in the cover since there are a lot of them (High King, Tanpopo #, ZYX-a, Shin Mini Moni, Pucchimoni V, Aa!, Guardians 4, Zoku Biyuuden, and Buono!). I like how most of the bottom half is taken by the logo for the concert since it makes it easier to identify among other DVDs. This is also one of the first times many fans will see the new costumes for the groups and as you can tell there are many great ones (Buono!, Aa!, Zoku Biyuuden and ZYX-a) and some that are among that many in H!P that make us notice the costumes more than the song itself (High King, Pucchimoni V, and Tanpopo #). 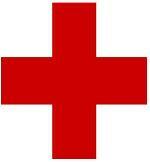 The background is a solid black which is not that exciting but slightly better than an overpowering color. Despite that the cover looks incredible since all of the members are present and even though some of them are in more than one shuffle group (Airi and Miyabi) it was an overall fair cover for everyone. Hopefully the cover for the accompanying concert tour titled Kachou Fuugetsu ~Mobekimasu~ is released soon as well. The release date is set for 3/31. 05. FIRST KISS / Aa! 06. Yume to Genjitsu / Aa! 12. Renai Rider / Buono! The DVD for Hello! Project’s 2010 Winter Concert Tour ~Shuffle Deeto~ has been announced. The setlist for the concert is shown above, although it might have a few changes since it is the setlist for the first day. It’s great to finally get a confirmation of the dates for the DVDs since I was somewhat curious as to how they were going to release the concerts, and I’m glad to see that we will be getting two separate DVDs, with the first release being the Shuffle Deeto DVD. Hopefully we get covers and a confirmed setlist for the DVD sometime soon (most likely near the end of February or the start of March). The setlist for Hello! 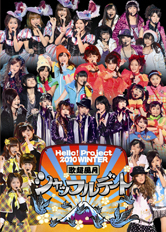 Project’s 2010 Winter Concert Tour Kachou Fuugetsu ~Shuffle Deeto~ has been released. For the most part the setlist looks fantastic since every group gets a chance to perform a few songs from their respective groups, but we also get a chance to see a random set of girls perform other shuffle songs such as BE ALL RIGHT! and Suki Sugite Baka Mitai. I’m particularly interested in the 15th track LOVE LIKE CRAZY since it features 3 of the best dancers from H!P: Ai-chan, Kame and Shimizu and also in the 14th track Suki Sugite Baka Mitai since it’s one of my favorite H!P songs. It seems that most groups got a chance to perform two songs before they moved on to another song, which is great news since it means that all of the members got plenty of time to shine. The fans at the concert also got a chance to listen to Guardians 4’s new song GOING ON! which is great news for us since we will probably also get a chance to hear the song when the concert rip is released. Overall I’m satisfied with the setlist since it features some of the best shuffle songs and it also gives everyone a chance to appear for at least two songs.